Pre-order your Samsung Galaxy S8, S8+ and LG G6 in Aerophone and get bundled accessories to optimize your smartphone experience. Aerophone opens pre-order for Samsung Galaxy S8 (S8+) and the LG G6 - both the hottest smartphones this season. These handsets are bundled with accessories that will enhance your smartphone experience. How to pre-order Samsung Galaxy S8, S8+ in Aerophone? For the Samsung Galaxy S8 and S8+, customers could go to the Samsung's pre-order page and select your preferred store. Alternately, you can visit any Aerophone stores nationwide and their staff will assist you with the pre-order. 1. Starter Kit On-the-Go (Clear Cover, Screen Protector, 5,200 mAh battery pack, USB Type C Cable. Final price less the discount is Php 2,639. 2. Starter Kit Basic (Clear Cover, Screen Protector, Wireless Charger Stand, Micro USb Cable). Final Price less the discount is Php 2879. 3. Convertible Wireless Charger for Php 3279. You'll have to pay Php 2,000 as downpayment within 48 hours to make your pre-order valid. You can get your Samsung Galaxy S8 handsets starting May 5. How to pre-order the LG G6 in Aerophone? It's basically the same drill. You just have to go to any Aerophone store nationwide from April 17 to April 30. The LG G6 is priced at Php 37,990. 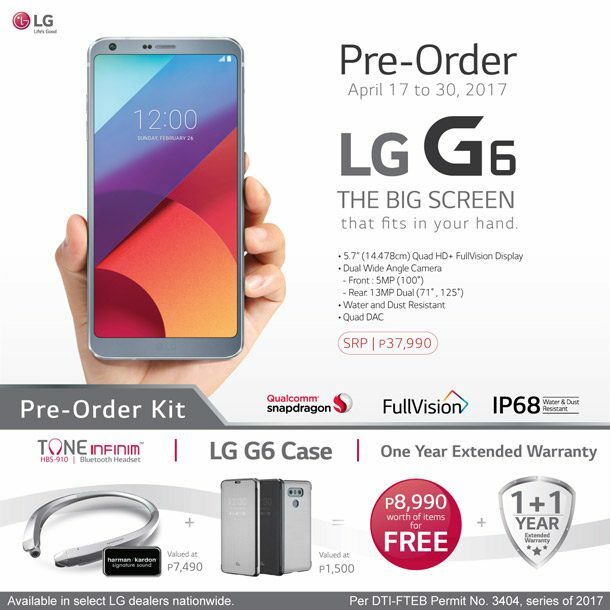 Successful pre-order applicants could avail Php 8990-worth of free items including Tone Infinim, LG G6 Case and one year extended warranty.